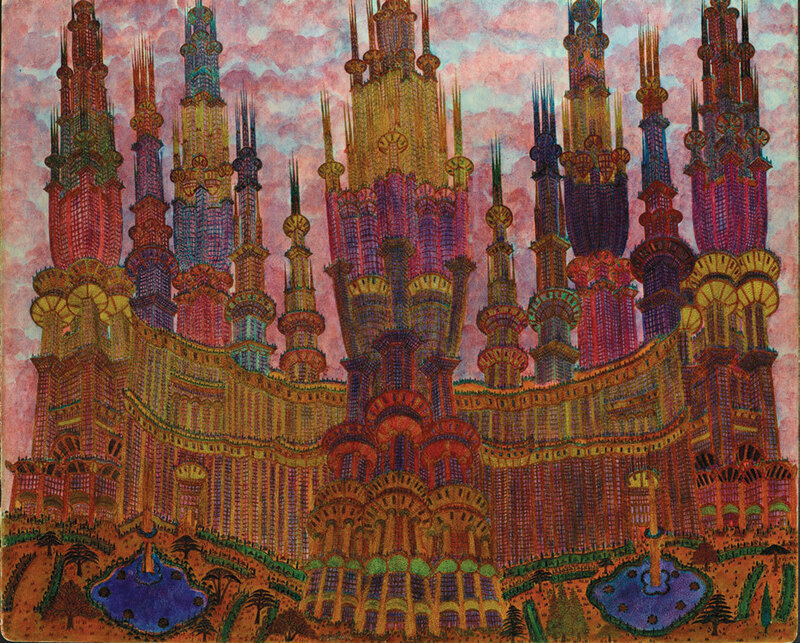 Marcel Storr, Untitled, ca. 1968, graphite, colored ink, and varnish on paper, 20 × 24". One can imagine self-taught artist Marcel Storr (1911–1976) in 1964, his head bent low over the Paris streets he was employed to sweep, as he studied the staggered patterns of the cobblestones. Back at his home in the ninth arrondissement, not far from the ornate Église de la Sainte-Trinité and the historic Notre-Dame-de-Lorette, he would dream up his own extraordinary ecclesiastical sites through a series of graphite and colored-ink drawings, roughly sixty-four in total, that he produced over the course of his lifetime. Though the significant gap in information about Storr’s life prohibits a clear understanding of his relationship to religion, his output indicates that he was searching for some kind of understanding, and perhaps to have a hand in divine creation.